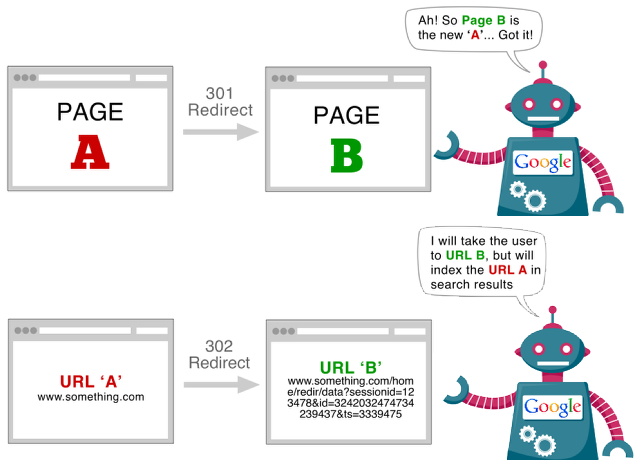 A redirect is a way to send both users and search engines to a different URL than the one they originally requested. 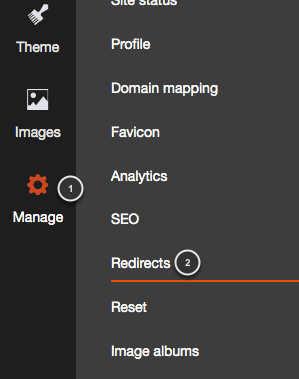 You can either click on the New (1) button or on the create a redirect (2) link. The domain name I have is mygreatwebsite.com, but the editor already knows it, so you don't need to write the whole domain name in here, you just need to add the name of the pages concerning the redirection. 1. Add the page from which you are going to create your redirection. Important: The URL you add on the From field has to be the one from a page on your site that no longer exists. This is in case someone bookmarked the previous URL or go to that link from somewhere else. Why would you want to make a 301 redirection? - If someone clicked a link on another site that points to a page that has now moved or is gone the visitor will get a 404 error page, indicating the web server cannot find the page. With a 301 redirect instruction in place you can send them to the correct page or an alternative page if the page was deleted. - A search engine bot is just like a visitor who has been directed to a page from a link within your site, from another site or from their records in their index. They need to know also that the page has been removed or moved to a new location. - Your page is listed in a search engine or a directory somewhere and that link you worked so hard for is now useless if you moved it without a 301 redirect. 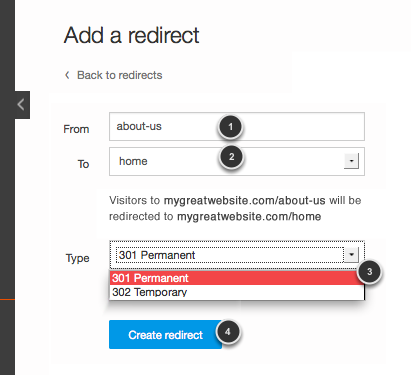 You need to keep that incoming link by including a 301 redirect instruction so you don’t loose the link. A directory editor might not take the time to find where you moved the page to and just delete the link. When you redesign a website with any changes to page names and/or location it is imperative that you do 301 permanent redirects so you do not have to start all over from scratch getting your new pages (possibly the whole site) reindexed in the search engines. Why would you want to make a 302 redirection? - A website is having technical difficulties so they 302 redirect the main URL (i.e. www.123name.com) to a backup website (www.456name.com) while they work on the existing site.